And so we reach the end of Chapter One of A Miracle of Science. Mark's first surprise (mentioned in his column last week) is the color page you see above. His second surprise is that Mark is moving to Chicago and therefore he dismantled his computer last night. My surprise is that we won't be going on hiatus while Mark moves. For the last few months, we've been promising "Additional Nonsense Coming Presently" in the text to the left of the comic, and I'm going to be providing that nonsense. Over the next couple of updates - while Mark gets back online - I'll be uploading nonsense like character profiles, location information, and background information. I'll be updating the front page of the comic with them on our regular Monday-and-Thursday schedule. Chapter Two starts on Monday, October 7th. Ta-da! It's in color! Although the Moon colony is so drab one could hardly tell! Well, whatever. 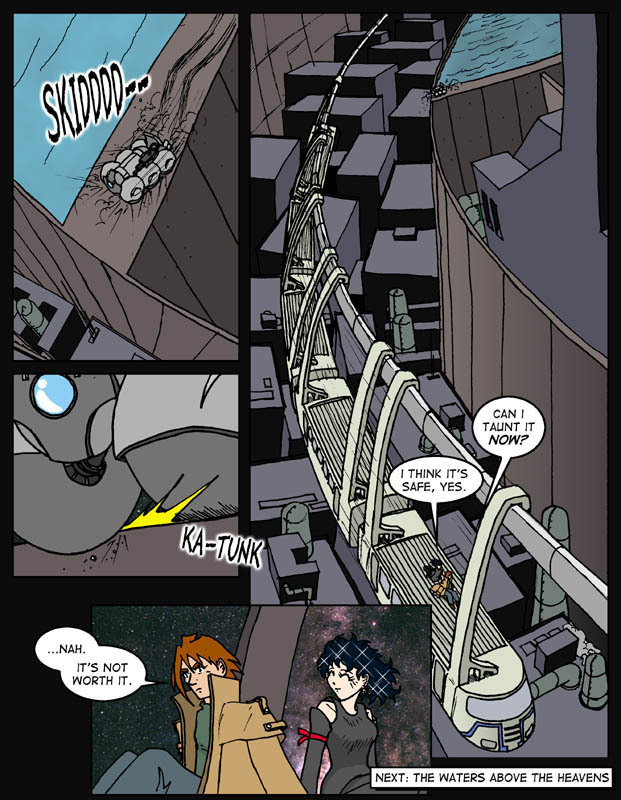 Anyway, there you have it: a freakin' twenty page chase scene wraps up the first part of A Miracle of Science. As Jon mentioned there will now be a short break in the story -- but please do keep coming back for the characters and fanart and story-so-far pages and all that stuff you expect from a webcomic these days. Chapter Two will start on October 7, 2002; mark your calendars, phone your neighbors, scribble a note on the dog.